I did like the hunger-&-meat-thing, but not affecting HP felt like a disconnect. Also, the story is bare-bones, with only one line of dialogue holding it up--and the town people are not helping. The title & subtitle (eat. sleep. repeat) seems to hold up the story, but was it "inevitable" that I visit the rabbit hole and eat meat? Because I don't get it. Is there more to this game? I would like to play whatever content I may have missed. And technically, I didn't go down the rabbit hole, so why am I being punished? I looked at it, but didn't go down . . . Maybe if you said "Don't look for the rabbit hole" or something like that, this might work better. Hey, the world's falling apart, but at least the shop's still opened! XD Seriously, he's one tile away from the darkness . . . poor guy. Alright, my house's half-eaten. Now what? 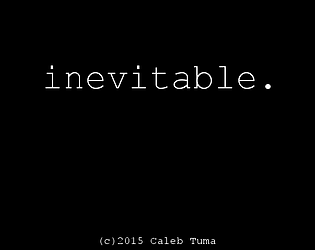 Or is this the "inevitable" the title talked about? If so, I don't know whether to praise you for conveying the meaning through mechanics, or scratch my head and ask whether anything else is happening, because it feels like cause & effect, with no effect. I'm going to assume the game ends there. You probably noticed I was commenting as I played through. I think this is pretty good, but there's too many meaningless elements in this game that delay progression. If they talked about the MC, the rabbit hole, or the black-cape guy, they could work, but they seem meaningless as is. I see I can feed him the meat after cooking it, but I don't see the point, other than delaying the actual story. Again, story & game disconnect. Alright, I cannot figure out how to get down the rabbit hole. Is there a way? You can't say "don't go down the rabbit hole" if there's no way to go down at all. And if there is a way, it's very well hidden. From the title, I thought this would be a game where I would do a routine over and over, to convey the routine-ness of life & death. Huh! Alright, I like the eating meat, then waking up & seeing the darkness. That's pretty cool, and actually made me gasp. But it also rendered everything else meaningless. You could've put the meat at the rabbit hole for me to cook. Just could've put a straight road outside my house leading to it, and then find meat when I spacebar the rabbit hole. Honestly, I don't see the point of all the other things in this game, and it feels like my time was wasted. First off, nice musical atmosphere. However, when the color palette doesn't support that atmosphere very well. I understand it's default RPG Maker VX Ace (I have the program myself), but still. The lines range from cliche (the old man) to creepy in all the right ways (the scarecrow) to just odd (the mirror). In the building on the right, sudden language! Seriously, it feels like it's there for no reason. At. All. Found the rabbit hole/grave. Now what? Thought I had to buy a shovel from the shop, but they only sell meat. If there's a puzzle here, it's very poorly conveyed. Also, please don't let the MC say he's "too hungry to eat" with full HP, when I am unable to feed him. Story & mechanic disconnect there.